Sometimes a beautiful card is one of the simplest cards. Of all the cards I've offered in my Christmas card classes this season, this is one of my favorites. I received the original card design while I was at Founders Circle, designed by my friend Sharon Armstrong, and I was taken with it right away. When I recreated it for my classes, I added to it a little bit, but kept the original layout because of it's simplicity. I used Very Vanilla cardstock as my folded card base and mounted the embossed Early Espresso layer on it. For the embossing, I used the Lacy Brocade Embossing Folder in my Big Shot - such a beautiful background design! I then spritzed it with my own mixture of Frost White Shimmer Paint and rubbing alcohol in one of our new Spritzer bottles. The focal image was cut with the Apothecary Accents Framelits in my Big Shot from Very Vanilla cardstock. 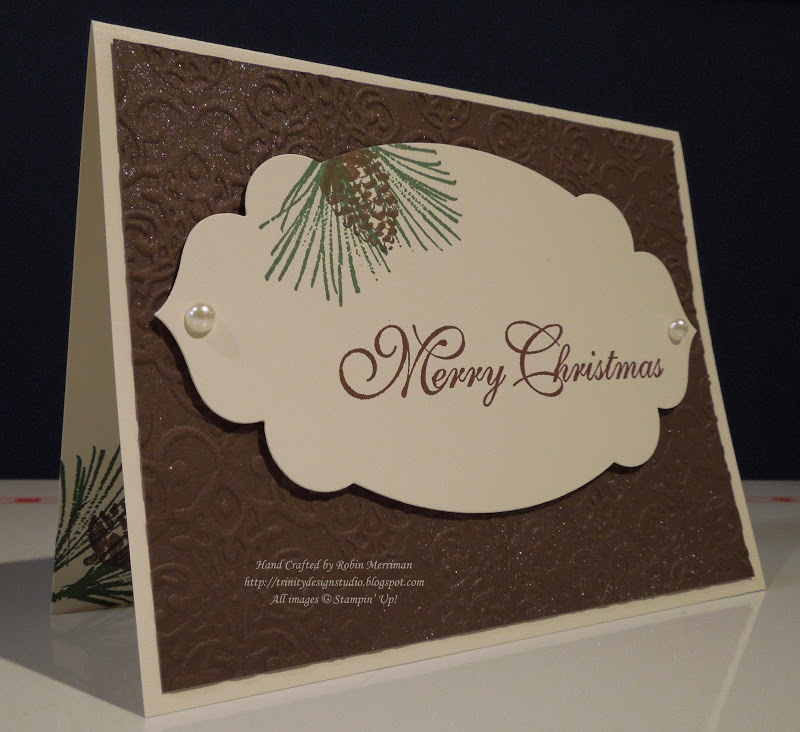 It's stamped with a greeting from the Greetings of the Season stamp set in Cherry Cobbler ink. The evergreen is stamped from the pine needles and pine cone from the Watercolor Winter stamp set. I used Garden Green and Soft Suede to color the stamps. It's stamped again in the inside left corner as a little accent. I added a couple of Large Pearls to the focal piece, popped it up on Stampin' Dimensionals and adhered it to the card front. One of the things I like best about being part of Stampin' Up! is that I have wonderfully creative friends and I don't have to come up with every project idea on my own. Face it, we're not all always inspired when it comes to being crafty! I know this card was enjoyed by my stampers and I hope it's given you a fresh idea today. You can visit my Online Store and shop for all the supplies you need to make this card. Just click this link here: Robin's Online Stampin' Store to get started. The Shop Now button is at the top right of the page and is your open door to the store. I hope you all have a fun Tuesday. 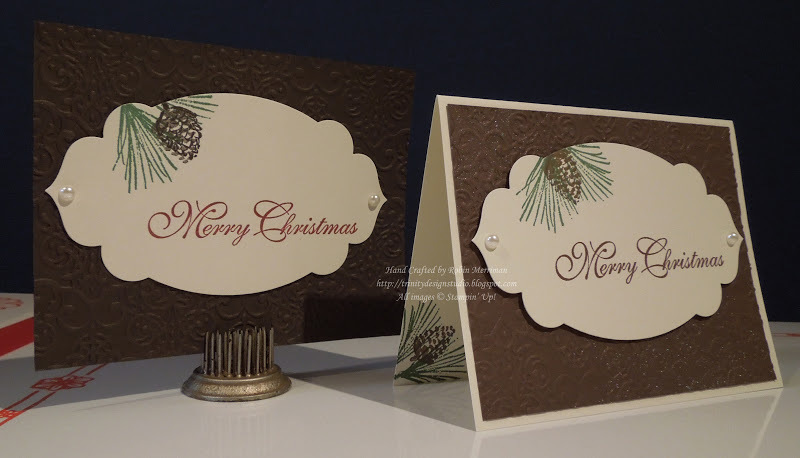 I'm headed into the studio for my two Snow Festival Card Classes - lots of stampin' fun going on here today! Just because you can't be here doesn't mean you can't create, so hey, Go Stamp Something Fun!